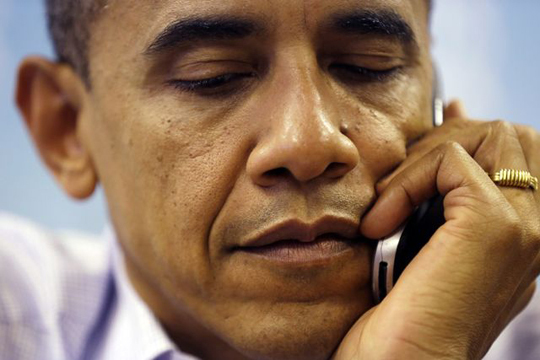 Obama now linked to ‘Operation Inherent Resolve’ — or was that ‘Inherently Flawed’? The Obama administration has, at long last, a name for U.S. airstrikes against the Islamic State group: Operation Inherent Resolve. It needed to come kicking and screaming to the table, but the name now stands. WASHINGTON (AP) — It’s less punchy than previous nicknames for U.S. conflicts in the Middle East — remember Operation Desert Storm and its thunderous attacks against Saddam Hussein? — but the Pentagon has finally named its fight against Islamic State militants in Iraq and Syria: Operation Inherent Resolve. The naming, which took weeks of deliberation behind closed doors at U.S. Central Command and at the Pentagon, is part of an effort to organize a long-term military campaign. Personally, I was hoping the White House would go with Operation Kobe Bryant, but that didn’t happen. Just days ago I said: “The logic seems to be that if President Obama can just eek out two years without naming operations in Iraq and Syria, then perhaps the never-ending mudslide of time will have an easier job of washing it all away…” Little did I know that the Wall Street Journal talked to military officials on Oct. 3, who conveyed that very same message. The Obama administration now owns “it” — whatever that “it” is. For months now the non-strategy of a strategy has seemed to be “No boots on the ground!”, which may be why U.S. officials are trying to spin Islamic State’s push towards Baghdad into “strategic momentum” for its coalition. The terrorists of the Islamic State have “tactical momentum on several fronts,” but the U.S. and its allies believe they have “strategic momentum,” the nations’ defense chiefs agreed Tuesday. Joint Chiefs Chairman Gen. Martin Dempsey and 21 of his senior counterparts from the coalition fighting the Islamic State of Iraq and the Levant also agreed that ISIL has been dangerously effective in its propaganda war, a military official said, and the allies must do more to counter it. When one reads the news they must always be on the lookout for strange euphemisms, diplo-babble, and legerdemain lexical wizardry from officials. The use of “strategic momentum” certainly qualifies when they speak on operations against Islamic State in Iraq and Syria. When one wants to hear what is really going on, that individual should pay more attention to guys like Gen. Ray Odierno, who are regarded as straight shooters. Army Chief of Staff Gen. Ray Odierno said Monday he is “somewhat” confident that the Iraqi army can defend Baghdad from the Islamic State in Iraq and Syria (ISIS). “I believe the capability is there to defend Baghdad. … But we’ll have to see what plays out over the coming days,” he told reporters at the Association of the United States Army on Monday. Defense officials are urging patience with the U.S. strategy against ISIS, even as the group makes gains in western Iraq and on the Syrian border town of Kobani. ISIS appears to be advancing closer and closer to Baghdad, however, where at least several hundred American troops and civilians are stationed. If the U.S. is only “somewhat” confident in the 60,000 Iraqi troops tasked with protecting Baghdad, then it is hard to see how officials can say the coalition has any kind of momentum. Regardless, it is clear that the Obama administration is going to need an extraordinary level of “resolve” to make Operation Inherent Resolve a success. Right now, however, it appears to think that dropping bombs for a couple years will buy it enough time to pass the baton to the next president. Remember: The more a U.S. official sounds like he’s been getting his talking points from the Ministry of Truth, the more closely you have to pay attention to what he is saying. Then, and only then, will you have a chance at discerning what he honestly believes. too bad our NATO ally, Turkey, decided to bomb Kurds instead of ISIS after strangling supplies to Kurds in Kobani. with friends like these, who needs enemies? The US and Turkey, the Middle East’s only NATO member state, are at a frustrating point in their relationship. The Syrian city of Kobane, which is on the Turkish border, is in danger of falling to ISIS. Turkey has lined up tanks on its border but isn’t sending in troops and is actively impeding Kurdish militants looking to reinforce the town. The US is bombing ISIS outside of Kobane, but the overwhelming likelihood is that neither side’s actions are meeting the other’s hopes or expectations. Yet today, Secretary of State John Kerry insisted during a press conference in Paris that there was “no discrepancy” between the US and Turkey on the issue. The apologists for the Obama administration in the media are somewhat culpable for this mess. Americans get slipshod foreign policy when a president is allowed to go for years without ever putting forth a coherent vision. partisans downplay the continuity. I think that’s a mistake. Who was this source, and if one were going to orchestrate the toppling of the entire Middle East and parts of Africa, then why on earth would they write an official memo about it and then email it to the kind of guys who are buddy-buddy with Wesley Clark? Heh. Wouldn’t it be cool if all conspiracies could be traced back to a single memo written by the Secretary of Defense, which said something like “It’s time to take down the Middle East — all of it — and we’re the guys who are going to do it,”? The same Wesley Clark who has admitted that the Clinton bombing in Kosovo (which he himself oversaw) was illegal? “Wes Clark and the neocon team.” A lot of conspiracy theories such as the one advocated by the Salon writer can be easily disproven. It would take a ton of people to keep their mouths shut. And I remember when Clark said that. I was surprised that he admitted it was illegal. If you’re a conservative and you even hint at the whiff of a conspiracy, then you’re a loon. If you’re a liberal and you use unverifiable “facts” given by a single anonymous source, then you’ve “exposed” the “neocons.” How convenient. Exactly. We’ve seen liberals do that in regards to Benghazi, the Obamacare rollout, the IRS scandal, the NSA scandal and other recent scandals. Dismiss it as the ravings of “loons,” and their LIV followers will lap it up. Gen. Clark’s act of exposing always seemed calculated for the political/media benefit of Gen Clark to me. I don’t like the blanket term “conspiracy theory” in this case as any group in command “conspires” for something and parts/attitudes may be true, but if he was that opposed why wait? Obama is commander and chief, so I’m not sure how he goes about not owning up to the military’s actions. Military, Syria, Turkey, ISIS, allow for more oil vs green production, healthcare, the economy, the debt…..the list goes on and on; it should be called Operation Overwhelmed. You beat me to it, Patrick. It is quite easy to take plans related to the long-term strategic goals of the United States and turn them into anything you want when you’re waiting six or seven years after the fact and then referencing some random anonymous dude. Real brave, Gen. Clark. Side note: I remember seeing this tidbit a year ago and I couldn’t help but crack up. Now that 68-year-old retired Gen. Wesley Clark is dating 30-year-old online entrepreneur Shauna Mei, the decorated warrior is hanging out with a hipper, younger crowd. Clark, who recently filed for divorce from his wife of 46 years, Gertrude, was rumored to have attended the Burning Man music festival a few weeks ago. And Tuesday night, Clark was spotted in a corner booth at uber-exclusive Meatpacking District hot spot Provocateur. The general, dressed in a sharp white button-down and khaki pants, huddled with two friends in deep conversation while an international crowd of partygoers and models congregated around the club. A few girls were spotted at his table early on, but none of them was Mei, the founder of AHALife.com. So many things to say. So many things… Heh. Well….don’t like jumping into personal lives much; however that story in conjunction with the above discussion shows a pattern of a guy more loyal to himself than family, commander in chief, political views, etc….have to be leery electing someone like that. I won’t comment on the divorce (who knows what happened), but it’s a little weird for 68-year-old man to start hitting up the club scene in NYC…running off to Burning Man with a 30-year-old woman, etc. wow, nice personal tear-down of a military officer. keep it classy guys. Lizard, the guy who can’t wait to use terms like “military industry complex” while implying that the CIA and the “neo-cons” in the military are behind all the world’s ills, etc., is suddenly shedding crocodile tears because someone dared to push back on Wesley Clark — and the single anonymous source he cited years after 9/11. Classic! Considering some of the things you’ve said to us (and me) in the past, I don’t think you have the right to complain about anyone being classy, hypocrite. Ha! I just love he trots out those terms to imply there’s some sinister “neo-con” conspiracy at work and then gets all defensive when we criticize Clark’s “anonymous source.” Somebody pass the popcorn! In Lizard19 speak, that was him acknowledging that his proof of some sort of conspiracy was eviscerated. Lizard can’t just say, “Yeah, coming forward with a single anonymous source years after the fact and years after he became a shill for the Democratic Party sort of hurt Clark’s conspiracy-credibility,” but he can pull the “How dare you zing an officer!” card. It’s just fun to watch when it becomes convenient for liberals — again, who constantly bash the military and its “neo-cons” — to go that route. Don’t know the general personally, just sharing my opinion on a public figure or news event like we all do. You usually are critical of the two party system; I would think Clark’s jumping and pandering to R’s and ultimately D’s would personify the apparatus you dislike. notice how the point I was trying to make of continuity between Bush and Obama is lost in all the noise. I saw your point, I was just suprised you drove it home with Clark…..interesting question, is it continuity, is Obama slowly coming around to Bush’s thinking, or two administrations stuck in the muck of the middle east…. Obama did everything within his power to get the heck out of Iraq. He wanted nothing to do with Syria. He wanted nothing to do with Afghanistan. He demonized Bush in 2008 and made him look like the ultimate warmonger. In short, 2008 Obama was everything Lizard19 could have hoped for. Then, the reality of the Middle East hit Mr. Obama with all the security briefings. Still, he resisted. But ultimately, the Middle East brought him around. Watch this video. It’s a classic. Stick around until the end. Obama’s problem is not that he’s too much like Bush — it’s that the president’s vision for the world is fundamentally flawed. The pendulum must swing towards Bush’s understanding of man. Lizard19 cannot accept that, which is why he’ll latch on to random anonymous sources given by opportunistic retired officers as proof of the conspiracy he’s peddling on any given day. Even as they castigate Mr. Obama, the neocons may be preparing a more brazen feat: aligning themselves with Hillary Rodham Clinton and her nascent presidential campaign, in a bid to return to the driver’s seat of American foreign policy. The fascinating thing about being so obsessed with Bush is that you’ll be able to continue blaming him for problems for the next 25 years. I look forward to seeing how much the logic can be tortured, say, a decade from now to blame Bush for any number of events. I have been constantly critical of the Obama regime. Yes, but your admonitions tend to be rooted in a frustration that he can not wrestle himself from a shadowy cadre of “neocon” figures linked to the Bush administration (or that he’s basically just like them). And now, apparently, Hillary Clinton is also a “neocon.” On some level I think it would be hilarious if she were the president for 8 years; coupled with Obama, that would grant us 16 years of liberals telling us that it’s all Bush’s fault. George W. Bush: The dumbest man alive, yet able to pull off complex conspiracies that changed the world — with no-one but the most astute liberals the wiser. I agree they have influence and will for some time as they have an established group and viewpoint to start from. I think Jeb Bush signed on some positions of the original PNAC statements; and it’s only natural his brother used the groups’ ranks to fill his staff if he agreed with them. They basically had a President in line with their positions and that gives influence. If even the Dems are seeing Obama’s foreign policy as poor; they have to look for other positions, and PNAC is a start. I don’t think this means they are making policy, but their ideas are being looked at. I’m sure Pre 9/11, when Bush signed off on a huge AIDS package for Africa and trotted out the education act with Kennedy that these ideas were in agreement with some of the more liberal think tank groups; yet no one thinks these groups were making policy behind the scenes. Upon reading the article, it sounds like Kagan is hedging his bets with the potential president; but I don’t think a whole neocon movement is now aligned with Clinton. Doug, I don’t expect you to have read much of what I have written the last few years, but my criticism of Obama’s foreign policy has mainly focused on…Obama’s foreign policy, not Bush’s. the humanitarian interventionists I criticized were dupes who went along with the nice packaging of regime change under the auspices of R2P. I tried pointing out that creating failed states would exacerbate extremism, and that is precisely what happened. but you conservatives think that if only troops were kept in Iraq then ISIS wouldn’t have evolved. I’m guessing I don’t hear conservatives criticize destroying the Libyan state as being a significant contributor expanding extremism because destroying Libya is in line with their foreign policy aims. Wrong. Nice red herring there. It’s not that Islamic State (i.e., a more extreme version of al Qaeda) wouldn’t exist — it’s that Iraq would not have imploded as it has. There’s a big difference between the two arguments. I can see why you would frame it that way, though; the distortion is easier to attack. I’m guessing I don’t hear conservatives criticize destroying the Libyan state as being a significant contributor expanding extremism because destroying Libya is in line with their foreign policy aims. So because conservatives aren’t talking about Obama’s bizarre decision on Libya…right now…or now…or now…they somehow don’t believe that it was a big ball (or was that bomb?) that was dropped with his “lead from behind” approach? Okay. I’ve said multiple times on this blog that Obama created a terrorist “jungle gym” in Libya. What do you want from me? I suppose if I had eight heads and sixteen hands I could start new blogs and talk about Libya more often, but the reality is that I have one head and two hands.